Newfangled fabrics can mop up energy that otherwise would be wasted. Clothing today is mostly about covering up. In the future, it might also be about powering up — literally. Researchers across the country are working to develop fabrics that harvest energy from your body movements and use it to provide a bit of extra juice for your cellphone or a fitness tracker — or maybe to change the color or pattern of the fabric itself. “Something that’s kind of snazzy,” says Dr. Cary Pint, assistant professor of mechanical engineering at Vanderbilt University in Nashville, Tennessee and a leading researcher in the field. One group of researchers at the University of Texas at Dallas has developed an energy-harvesting yarn made of carbon nanotubes, hollow cylinders 10,000 times thinner than a human hair. The tubes are bound into larger yarns and twisted so much that they coil. 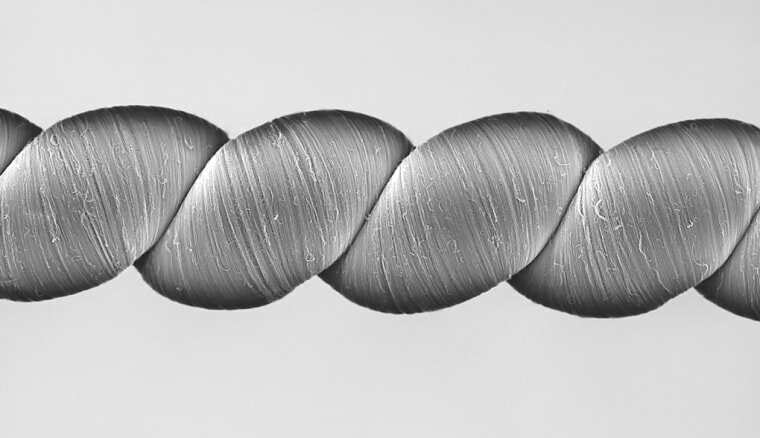 Experiments show that when these tightly coiled “twistron” yarns are placed side by side and then stretched, they generate a tiny electrical current. "There's basically no game in town which gives comparable power output to our yarns,” says Dr. Ray Baughman, the UT professor of chemistry who leads the researchers. In one recent test, described in a paper published Aug. 25 in the journal Science, a tight-fitting shirt containing two short pieces of twistron yarn produced 16 millivolts of electricity each time its wearer inhaled. That’s not nearly enough to fully charge a cellphone in a reasonable amount of time; a cellphone charger uses about 300 times the voltage. But it might be enough, for example, to send wireless messages about the wearer’s health to a router. machHave Physicists Found the Key to Safer Nuclear Power? Baughman says that as a result of the research he’s fielding inquiries from medical equipment manufacturers looking for new ways to monitor people’s health. In a paper published last October in Nature Energy, a team at the Georgia Institute of Technology in Atlanta reported that they had created a woven fabric containing solar cells and tiny triboelectric generators. It’s able to harvest energy from sunlight and movement at the same time. So far, the Georgia researchers have produced only small patches of the stuff, so don’t expect too see it on clothing racks this season. Pint, the Vanderbilt researcher, is taking another approach to harvesting energy. Using “nanosheets” of phosphorus just a few atoms thick, his team has created a prototype that generates peak power of about 40 milliwatts per square foot (a light bulb draws about a thousand times more). The research was described in a paper published August 11 in the journal ACS Energy Letters. Pint says he’s working with fabric specialists to integrate nanosheet technology into clothing — and he sees potential for a sort of souped-up fitness tracker that uses harvested energy to monitor limb position and movement, so you can tell if you’re running efficiently or limping a bit when you walk.